From Crayfish to Iron Article received from: "The Cape Odyssey"
During World War II Saldanha Bay (North Port as it was known in World War II) assumed great importance. The occupation of the Suez Canal by Axis forces early in the war forced the allies to rely on the Cape Sea route to pass between the Atlantic and Indian Oceans. Saldanha Bay was identified as a convoy staging point. In 1942 the 8th Heavy Battery of Coastal Artillery set up coastal defence guns at South Head, Baviaansberg, Malgaskop and Elands point. A Boom Defence (minefield) system was laid between Hoetjies Point and Marcus Island and between Marcus Island and Elands Point and the SA Naval Forces manned it. The SA Naval Forces had a special plan with the manning of these minefields. North Bay Naval Barracks were customized for 36 SWANS (South African Women’s Auxiliary Naval Service). 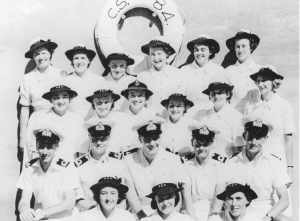 The women would be trained in Controlled Mining Operations and on completion they would guard the entrance of the Harbour against enemy ships and submarines. This was done to have equipped SWANS manning Harbour Defences and get more men out to sea for the war effort. The first 15 SWANS arrived by train in Saldanha on 7 April 1944 where two troop carriers were waiting to transport them to the nearby Naval Base - after an 11-hour train ride from Cape Town and sitting in the back of military trucks. Lieutenant Commander W. B. Holmes (Officer in Charge of CS 84) welcomed them to their new home at North Bay. Lieutenant Commander Holmes received his training at HMS VERNON and planned the defence of North Port at HMSAS Unitie (Cape Town). He later got the nickname “Daddy” for the pride he showed in the SWANS that replaced the male watchkeepers at CS 84 (Control Centre to the boom defence). Lieutenant Commander Holmes was an expert on harbour defence and the standard he laid down for the trainees was quite high. As soon as the SWANS were settled into the picturesque North Bay, the training started. The women, most of them clerks, had to learn to distinguish the different readings they received from the Electro-magnetic field that ran around the minefield. The magnetic field detected any ship or submarine that tried to enter the bay. It also detected the loops moving on the seabed when the sea was rough, thereby cutting the earth’s lines of the magnetic force. Sharks, fish and whales luckily had no effect on the field. The women stayed at North Bay Naval Barracks and were isolated from the rest of the Naval Ratings. CS 84 was plus minus 500 meters from the camp on the side of Malgaskop and the SWANS assumed their duties there. On 1st of June 1944 a dance was arranged at Klipvlei. In the words of Leading Seaman Sue Labuschagne: “A dance in Saldanha is like manna in the desert”. The Duty Watch of that night wanted to attend this rare event and they asked the Duty Watch of Leading Seaman Labuschagne to exchange duties with them. Feeling kind-hearted they agreed and kept watch till midnight while the rest enjoyed the dance. At 2250 a signal that something was passing over the guard loop was received and the Officer of the Day (Lieutenant de Beer) was notified. Lieutenant de Beer phoned Lieutenant Commander Holmes and within minutes officers started arriving at CS 84. The idea of a German submarine in Saldanha Bay was a nightmare with convoys lying at anchor full of cargo destined for the war in Europe. A while later the object crossed one of the eight mine loops. The procedure was to fire but Lieutenant Commander Holmes said Sue must hold fire knowing that the object will not be able to penetrate the anti-submarine nets suspended across the harbour mouth. At 2319 the object was trying to leave the bay and passed over the loop heading out to sea. Lieutenant Commander Holmes waited for the critical moment and then said, “Let them have it! Leading Seaman Labuschagne pulled the lever and fired 16 tons of TNT (two lines of mines). This was met with an illumination of the Bay by searchlight and a frantic rush back of all the merry-makers from Klipvlei. No boat was seen and the next few day searches for submarines could not be done due to bad weather. When the search did start nothing was found, not even wreckage of the boat. The rip tide that the explosion started was to blame. Later a ship’s asdic located something on the seabed that had the shape of a U-boat’s conning tower. This turned out to be a rock formation. No evidence was found of the wreckage in the bay during the following weeks and in the 1970s a modern harbour was built that revealed no sunken submarine. After this incident the story started doing the rounds that this dark headed girl fired in anger and spoiled the party at klipvlei. The Duty Watch of Leading Seaman Labuschagne was therefore named “The Death Watch”. On 6 April 1945 the minefields were fired again. This time it marked the disbanding of the harbour defence in Saldanha bay. Leading Seaman Labuschagne was later married to Vivian Hodginson one of the drivers that picked them up at the station in Saldanha. Germany did report a submarine lost on the night of the incident in the North Port area, but the wreckage and Sue are still at large. Webmaster's Note: My appreciation to Mr Gabriel Athiros, editor of "The Cape Odyssey", for permission to publish this article on sawestcoast.com. "The Cape Odyssey" is a must for everyone who enjoys reading and learning about the colourful and fascinating history of the Cape.